We present an excellent range of Pinewood Pallets for Chemical Industry. These pallets are carefully designed for storage and transport of chemicals. 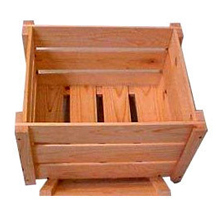 Made from best quality pine wood that imparts durability and does not affect the shelf life of chemicals, this pallet is available in wide varieties of sizes and dimensions. Ideal for storage and shipping purpose, our pinewood pallets completely protect the chemical from outside elements like moisture, humidity and dust. Our production facility is fully equipped and capable enough to complete minimum order quantity of 500 pieces on time. We use galvanized nails and screws to assemble these pallets for withstanding shock during transport. It is designed in such a manner that no dust gets accumulated, thus preserving the quality of chemicals. Eco friendly in nature, these pinewood pallets can be reused again and again.